Many of the most colorful birds in the world are small species. But there are also a considerable number of colorful medium-sized birds. Here are some of the most brightly-colored medium sized birds in the world. All the birds on the list weigh not less than 1 kilogram. The Temminck's Tragopan is a colorful medium-sized pheasant. It can grow up to 64 cm in length. The male is a stocky red-and-orange bird with white-spotted plumage, black bill and pink legs. It has a bare blue facial skin, inflatable dark-blue lappet and horns. The female is a white-spotted brown bird with blue circular eye skin. The Indigo-banded Kingfisher is a brilliantly-colored bird native to the Philippines and can be found in the island of Luzon and nearby islands. The Indigo-banded Kingfisher feeds on fish and aquatic insects. It perches on rocks and overhanging branches and foliage and dives steeply into the water to catch its prey. It is one of the largest species of kingfisher in the world. 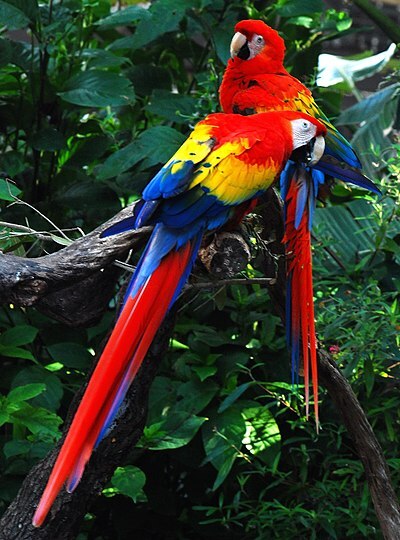 The Scarlet Macaw is a large, colorful macaw that can weigh up to 1 kg with a body length of 81 cm. It is native to Central and South America. This colorful bird is the national bird of Honduras. The Blue-and-Yellow Macaw is a colorful parrot native to Central and South America. This brightly colored bird that can reach a body length of 86 cm is an endangered species in Trinidad and is on the verge of being extirpated from Paraguay. This macaw species that can weigh up to 1.3 kg still remains widespread and fairly common in a large part of mainland South America. It is also known as the Blue-and-Gold Macaw. The Red-and-green Macaw is a large macaw which can attain a weight of up to 1.7 kg and a body length of up to 100 cm with a wingspan of up to 125 cm. It is native to South America. It is also known as the Green-winged Macaw. The Hyacinth Macaw is the largest of all macaws with a length of up to 100 cm or 3.3 ft from the tip of its head to the tip of its tail. It is also the largest flying parrot species in the world. It can weigh as much as 1.7 kg and has a wingspan of up to 86 cm. It is native to South America. The Wood Duck is a beautifully colored duck found in North America. This colorful North American waterfowl is typically 54 cm in length with a wingspan of up to 73 cm. It is also commonly called Carolina Duck. The Mandarin Duck is a lovely-looking colorful medium-sized duck that grows up to a length of 49 cm with a wingspan of up to 75 cm. The male is very much brightly colored compared to the female species. The male has a red bill, large white crescent above the eye and reddish face and "whiskers". The breast is purple with two vertical white bars and the flanks ruddy, with two orange "sails" at the back. The Golden Pheasant or Chinese Pheasant is a colorful gamebird native to China. It can attain a length of up to 125 cm. It is characterized by its golden crest and rump and bright red body. The deep orange "cape" can be spread in display, appearing as an alternating black and orange fan that covers all of the face except its bright yellow eye, with a pinpoint black pupil. If u want please inform me by post a comment in my site.Thank you.